Quayshawn Spencer, Robert S. Blank Presidential Associate Professor of Philosophy, explores the question, "What kind of thing is race?" in his classes and research. Quayshawn Spencer asks a simple question about race with a not-so-simple answer: What kind of thing is it? Spencer, Robert S. Blank Presidential Associate Professor of Philosophy, poses the question to undergraduates in his Philosophy of Race course. He is a specialist in the philosophies of science, biology, and race, and his course examines the very nature and reality of race, beginning with early theories put out by European thinkers including François Bernier and Immanuel Kant. Kant’s 18th-century essay “Of the Different Human Races” provided a scientific definition of race that would influence a long tradition of scholars using science to reinforce negative racial stereotypes—a tradition that Spencer’s course investigates alongside more contemporary philosophical, social, and political questions about race and racism. In his own work, Spencer uses his training in philosophy and biology to investigate the study of human genetics, which, for the past few decades, has provided evidence that challenges the idea that different races of humans are biologically separate and distinct. However, some argue that racial classifications can still be useful for geneticists and public health researchers who examine the correlation between disease and genetic ancestry. Until very recently, genomic research has lacked diversity, relying heavily on samples of people with majority European ancestry. In fact, recent research by Sarah Tishkoff, David and Lyn Silfen University Professor in Genetics and Biology, suggests that the lack of diversity in genomic research can have major medical consequences. The research received wide media coverage, suggesting that Spencer's question—What kind of thing is race?—is a philosophical query with popular appeal. 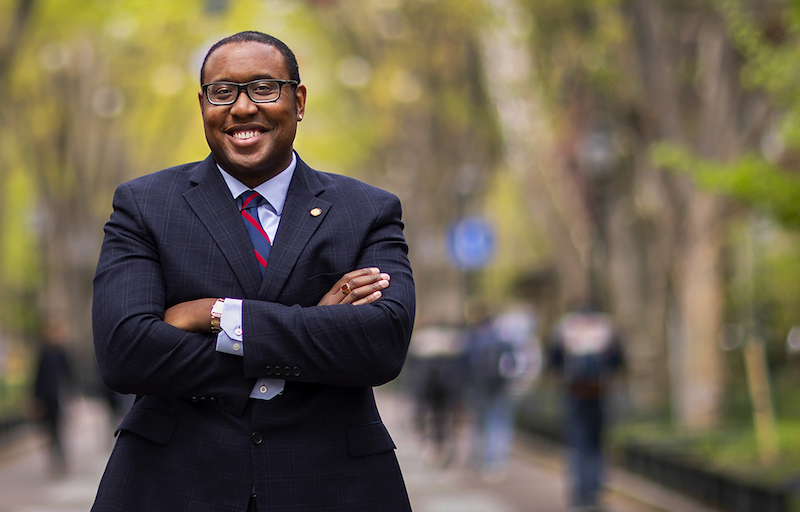 Quayshawn Spencer will present his 60-Second Lecture, "What is Race in the USA?," on Wednesday, April 3rd, at 12 p.m. in front of the Benjamin Franklin Statue on College Green. To listen to previous episodes of the OMNIA podcast by Penn Arts and Sciences visit our website or subscribe on iTunes. Samuel Freeman, Avalon Professor in the Humanities, has published Liberalism and Distributive Justice, which discusses the history of liberalism and the economic theory of distributive justice. Galápagos sea lions and the 8,000 residents of Puerto Baquerizo Moreno, San Cristóbal Island, often compete for space on local beaches and along the waterfront. A new Penn Arts and Sciences program encourages faculty to explore innovative ways of applying their expertise and working with students to address societal challenges.